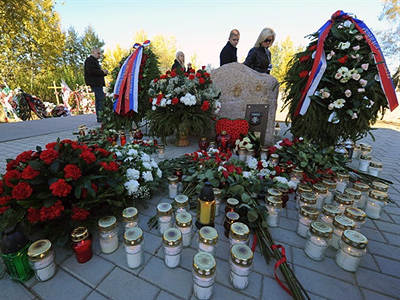 Moscow and Warsaw have agreed to set up a group to design a monument that will be erected at the site of the plane crash that killed Polish President Lech Kaczynski and 95 others. ­“I would like to announce that [Mr Komorowski] and I have agreed on creating a special interstate group that will develop the project of this monument,” President Dmitry Medvedev said after a meeting with his Polish counterpart Bronislaw Komorowski. 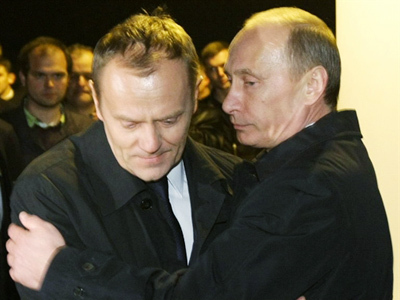 “The [Polish] President and I will provide full support,” he added as cited by Interfax. Komarowski also noted that the inscription to be placed on the memorial will be in both the Russian and Polish languages and will be agreed upon by both sides. 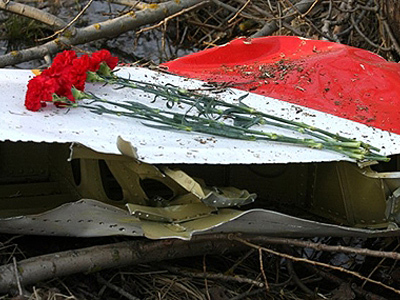 President Medvedev underlined that Russia grieves over the tragedy together with its “Polish friends” and will do everything possible to establish the reasons for the crash. "As for the investigation and criminal and legal aspects, as the probe goes on, clear conclusions must be drawn in accordance with the law which should be public and clear," he said. "In any event, that which is being done now must be followed through to the end. This is the duty of governmental agencies and investigators." The Russian and Polish presidents arrived in Smolensk, west of Moscow, on Monday to pay tribute to the victims of last year’s tragedy. 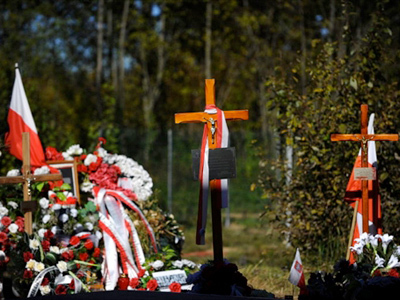 On April 10, 2010, the plane with the Polish delegation crashed on its way to the Russian city where Kaczynski, along with the country’s top military and political officials, were to take part in events to commemorate the thousands of Polish officers executed in the Katyn forest by the Soviet secret police service, the NKVD. The tricky issue that has be a thorn in relations between Moscow and Warsaw for several decades was also discussed during the meeting between Medvedev and Komarowski. The Russian leader stressed that it is the former Soviet leadership that bears responsibility for the Katyn Massacre. “Any other theories are not based either on historical documents or on moral considerations," Medvedev said, adding that Russia’s stance on the matter remains unwavering. Earlier in April, Moscow handed over new files to Warsaw concerning the execution of 22,000 Polish officers in 1940. The materials of the case investigated by Russian military prosecutors included notices of conviction and description of the sites where the Polish prisoners were buried. President Medvedev underlined that the process of passing the case materials to Poland must be completed and added that he urged the relevant Russian organizations to speed up the process. He added that he believes that “for the sake of the future” the two countries should turn that page of their history, but, he underlined, it should still stay in people’s memories. Komarowski, for his part, said that Poland also "wishes to close the chapter on Katyn in the great book of Russian-Polish relations." However, he noted, before that happens, “this chapter must be read to the end". 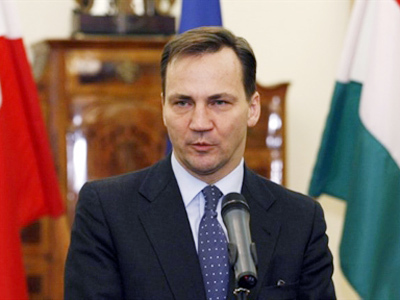 He also praised the progress achieved on the matter, saying that Poland believes that “the declassification of all the documents would put a logical end” to the Katyn Massacre issue. “We expect that the policy of rehabilitation of victims of the Katyn crime will continue. 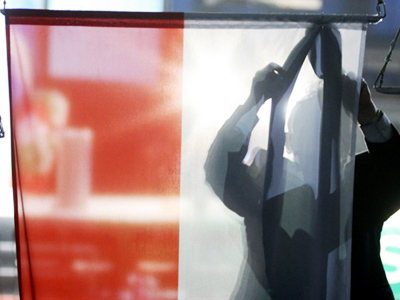 There has been political rehabilitation via a statement by the State Duma. But we expect legal rehabilitation of the Katyn victims," Komarowski said. 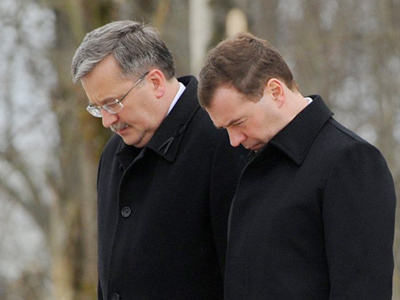 Following the talks in Smolensk, the two presidents were led to the scene of the TU-154 crash to lay wreaths at the birch tree which the plane caught shortly before the accident. The delegations observed a minute of silence to commemorate the victims.